The deadly shooting at an Orlando nightclub is a reminder that despite the progress Canada and the U.S. have made much work is still needed to ensure equality for all LGBTQ people who still face discrimination, advocates say. 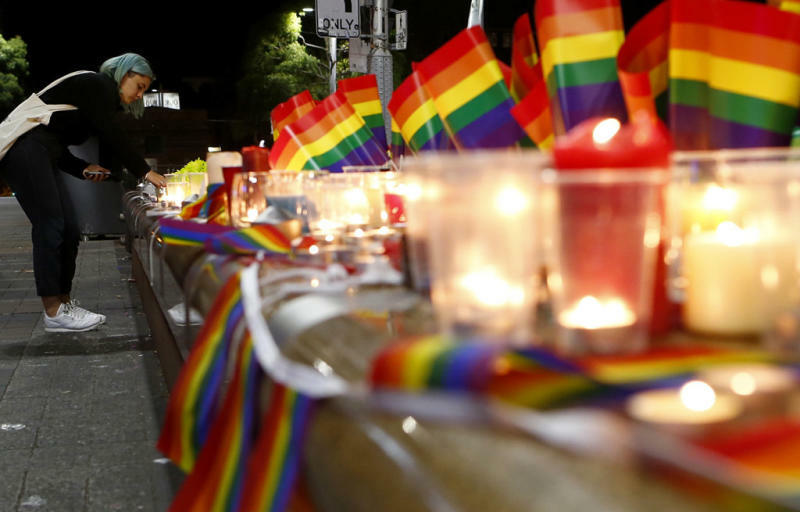 “This level of violence is a stark reminder that living our lives proudly and openly has inherent risks in 2016,” Kristopher Wells, faculty director of the University of Alberta’s Institute for Sexual Minority Studies and Services, tells Yahoo Canada News. Significant strides have been made for the LGBTQ community in this country, starting with the legalization of homosexuality less than 50 years ago. Marriage equality has existed across the country for more than a decade. New Brunswick recently announced that provincial health care would cover the cost of gender-confirmation surgery, meaning all provinces now would. And a federal bill to extend human rights protections for gender identity and gender expression was recently introduced in the House of Commons. But there is still work to be done to ensure full equality for LGBTQ people in Canada because discrimination is still an everyday experience for the community, Jeremy Dias, community director for The Canadian Centre for Gender & Sexual Diversity, tells Yahoo Canada News. The trans rights bill has been introduced twice before, Dias points out, and hasn’t passed yet. Though the expansion of funding for gender-confirmation surgery is a positive development many trans and non-binary people across Canada lack equal access to even basic health care — and the only clinic to provide all of those surgeries was hit by an arson attack earlier this year in Montreal. Many LGBTQ parents still have to adopt their own children because of provincial laws around parental rights. “In our home province of Alberta we recently had groups of parents protesting on the steps of the legislature in Calgary, in record numbers, to protest the right of LGBTQ students to safety and recognition,” Wells says. It was great to see a Pride flag go up over Parliament Hill earlier this month, he says, but the Canadian government needs to do more to protect human rights at home and around the world. Part of making that change is increasing the visibility of LGBTQ history, culture and issues in Canadian schools, Wells says. Research shows that gay and trans bullying is the most common form of bullying in Canadian schools, many of which still don’t allow any kind of LGBTQ extracurricular groups or educational components, Dias says. His own organization is going Monday to a school outside of Ottawa to speak to students in Grade 7 and Grade 8 about queer and trans issues, Dias says. For many of those students, this will be the first time in school that they hear about these issues or about the realities of everyday life for LGBTQ Canadians. Part of that education involves addressing the intersecting realities that exist within this issue, Dias says — for example, the fact that trans people and LGBTQ people of colour often bear the heaviest burden of prejudice including housing discrimination, restricted access to health care and violence. A recent Ipsos poll, commissioned by Yahoo Canada, found that LGBTQ people feel less safe and supported in their communities than straight Canadians. This was especially true for transgender people. Black, Jewish and LGBTQ Canadians are the three groups most likely to experience hate crimes, Wells says, and LGBTQ people tend to suffer the most violent of those attacks. To experience such an attack in a gay bar cuts particularly deeply, Wells says, because that’s traditionally been a safe space for LGBTQ communities. And Pulse in Orlando isn’t just a gay bar, Dias points out — it was largely organized by queer and trans people of colour and Saturday night’s event was aimed at the Latino community. The work the LGBTQ community in Canada will do in the aftermath of the Orlando shooting is the same work that agencies like his own have been doing all along, Dias says. What is needed in particular right now is the support of allies who are willing to counter discrimination when they see it, give time and money to support community groups and create space for LGBTQ voices. Educating themselves about LGBTQ issues is an important part of that work, Dias says. People who want to end the homophobia and transphobia that still exists in Canada need to recognize first that it’s there and then support the work of the LGBTQ community, from pushing politicians to support laws that expand civil rights to countering slurs when you hear them, Dias says.